Originally published in the Bozeman Chronicle here. After about two weeks of uncertainty, 25 bison inside corrals at the northern edge of Yellowstone National Park will still have a shot at being sent to a tribal reservation and the annual slaughter program will be allowed to resume. Montana Gov. Steve Bullock sent a letter to Yellowstone National Park on Thursday lifting a ban on shipping bison to slaughter after the state and federal agencies struck a deal to move 25 bull bison to corrals near Corwin Springs. The letter came two weeks after Bullock blocked the transport of any bison to slaughter facilities in Montana. That decision was over a group of 40 bison the park originally wanted to send to the Fort Peck Indian Reservation. Fifteen of the 40 will be slaughtered, but the other 25 bison may eventually be destined for Fort Peck. “The parties have committed that these animals will be quarantined and safeguarded until they are ready for shipment,” Bullock wrote in the letter. About 5,500 bison live in Yellowstone. The animals migrate into Montana each winter, and livestock officials and producers worry they could transmit brucellosis to cattle. Brucellosis can cause cattle to miscarry, but no case of bison transmitting the disease to livestock has been documented in the wild. A 2000 bison management plan rooted in the fear of brucellosis calls for a population of about 3,000. Each year, officials try to bring the population closer to that number through hunting and slaughter. This year, they plan to kill as many as 1,300. About 300 have been taken by hunters so far this winter. Last year, Yellowstone National Park proposed sending some bison to Fort Peck for quarantine, a process by which they can be deemed brucellosis free. Officials set aside a group to be used for the program while they were trapping bison last winter. They tested the animals for brucellosis regularly, and the 40 they held onto consistently tested negative. But the proposal never received final approval because of a state law that requires bison be certified brucellosis-free before they are transported through Montana, so park officials had decided to send the 40 bison to slaughter. Bullock sent the park a letter in mid-January blocking the transport of bison into the state until they could find a way to preserve the bison for Fort Peck. After two weeks of negotiations, the parties reached the deal announced Thursday. The 25 bulls will be sent to corrals controlled by the U.S. Department of Agriculture’s Animal and Plant Health Inspection Service, and the other 15 — all females — will be sent to slaughter. Mike Honeycutt, the executive officer of the Montana Department of Livestock, said that decision was made because female bison are a bigger risk for spreading brucellosis because the disease is primarily spread through afterbirth. If one of the females is infected and aborts a calf, all the animals would be at risk. “There’s a potential there that they are pregnant and there’s a potential that they could abort,” Honeycutt said. He said the Corwin Springs corrals — where APHIS is researching a bison birth control drug — also had limited room. Bison will be moved around there to accommodate the 25 bulls, but they couldn’t find room for the 15 females, which would likely have needed a separate corral. He also said the quarantine time would be shorter for bulls than females, and that it’s possible the 25 bulls could be sent to Fort Peck after about a year. Dennis Jorgensen, a senior program officer for the World Wildlife Fund, said in an emailed statement that while his group is pleased the 25 bison won’t be slaughtered, they hope the different agencies will find a way to allow a tribal quarantine program to proceed. 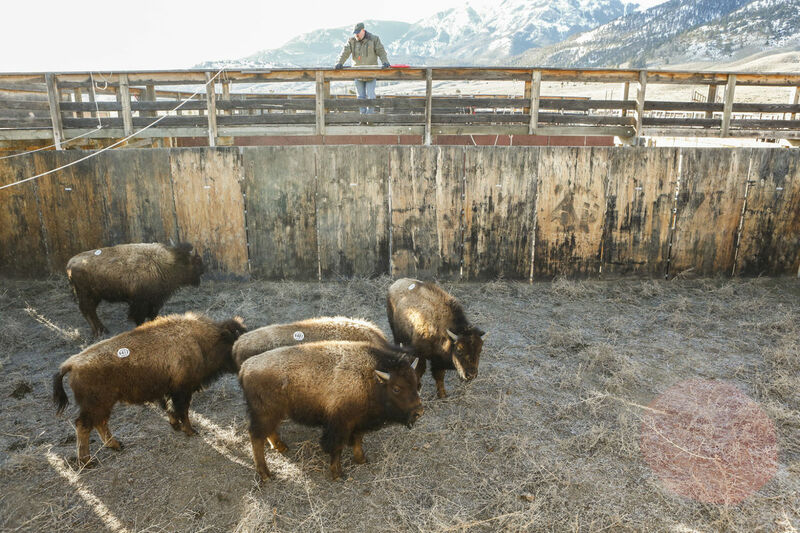 “This temporary measure still leaves Yellowstone with no alternative but to ship bison to slaughter in coming years when thousands of bison will need to be culled just to keep current numbers in check. We ask that the same parties who made a deal today continue the discussion until a long-term solution is reached,” Jorgensen wrote.